It’s an age-old debate: do you buy a specialist tool that performs a specific task really well, or do you opt for a multifunctional tool that tackles the job reasonably well, but saves you the trouble of carrying more than one tool? You may find yourself in a similar situation when purchasing your first 12V camping fridge, and having to decide between a dual compartment fridge / freezer, or a dedicated single bin. Naturally, like most camping decisions, it’s often a question of space… although there are some performance factors to consider, too. The 60-litre double din boasts two compartments, along with individual thermostats and temperature control. This means you can run the unit as a fridge-freezer combination, or as a dedicated fridge, or dedicated freezer. The choice is yours. National Luna’s two new fridges provide an example: the 55-litre sports a single-bin layout, while the 60-litre boasts a dual-control double bin. Both fridges feature the same external dimensions, 750 x 425 x 535 mm; but in terms of capacity, the 55-litre is manufactured with 60 mm insulation all-round, while the 60-litre uses 42 mm around the fridge compartment, and 60 mm around the freezer side. So, how does this affect your decision? Power consumption is determined by several factors (compressor performance, conductivity and electronic design), but the efficiency factor often comes down to insulation. Although National Luna’s new 60-litre is the most powerful fridge / freezer combination on the market, this impressive unit cannot match the specialist performance of the dedicated single bin. Thanks to its generous 60 mm insulation all-round, the 55-litre cools faster, stays colder for longer, and uses less power. The downside is that the 55-litre can be used as a dedicated fridge only, or, as a dedicated freezer only. In comparison, the 60-litre fulfils both of these roles in one package; and, because of its dual controls and high performance compressor, both compartments can be set to the same temperature to be used either as a fridge, or as a freezer. In other words, the fridge section is able to cool right down to ‑12Cº if need be! The 55-litre single-bin unit can be used as either a dedicated fridge, or as a dedicated freezer. What’s more, thanks to its generous insulation, the 55-litre cools down fast and uses less power once it’s reached the desired temperature. The unit can also hold more than 90 beverage cans! Because space isn’t a problem, many off-road trailer and caravan owners prefer to travel with two single-bin units: one is kept in the vehicle as a dedicated fridge, and the other is mounted in the trailer as a dedicated freezer. Professional tour operators who cater for their clients and require a dedicated and large-capacity freezer often do the same. The duration of your camping trips will also play a role. If you typically camp over long weekends, usually for not more than four or five nights, then there’s a chance you may not need a freezer section at all, and a single-bin 55-litre will serve you well. However, the great thing about the double-bin 60-litre is that it offers the ultimate in versatility, providing the option of twin fridge, or twin freezer, or fridge + freezer. The choice is yours! Description: Single-bin fridge / freezer. Insulation: 60 mm sidewalls all-round. Battery protection: High, medium and low. Operating voltage: 12 Vdc, 24 Vdc and 100 to 240 Vac. Weight: 22.4 kg (Aluminium) or 26.6 kg (Stainless Steel). Optional extras: Baskets (Aluminium) and protection jacket. *Average power consumption: 27.343 Amps @ 12Vdc. *Measured over a period of 24-hours, using three select ambient temperatures (21ºC, 32ºC and 43ºC respectively) and with the unit set to -10ºC. Description: Double-bin fridge and freezer combination with independent thermostats. Insulation: 42 mm sidewalls around fridge compartment, and 60 mm around the freezer. Weight: 23.7 kg (Aluminium) or 28.2 kg (Stainless Steel). *Average power consumption: 34.434 Amps @ 12Vdc*. *Measured over a period of 24-hours, using three select ambient temperatures (21ºC, 32ºC and 43ºC respectively) and with the unit set to -10ºC (freezer side) and +4ºC (fridge side). 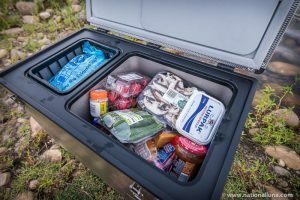 Boasting the largest range of 12V fridge / freezers in the world, National Luna is the only commercial manufacturer of off-road fridges in SA, and the preferred supplier to all major off-road trailer and caravan manufacturers. 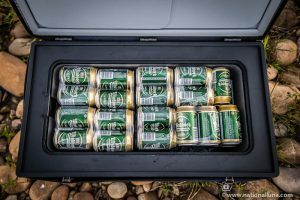 Previous Previous post: Is a 12V camping fridge really worth it? Next Next post: Is ’n 12 V-kampyskas regtig die moeite werd?